Address: The Maricopa County Jail has eight separate facilities. They are known as 4th Avenue, Durango, Estrella, First Avenue, Lower Buckeye, Madison, Tent City, and Towers. The street address and the mailing address is the same for all of the prisons. However, before mailing anything to an inmate in the Maricopa County Jail, you should review the jail’s policies. Not only are inmates restricted to only receiving postcards, but the postcards have to comply with very stringent rules. They must be between 3.25 inches x 4.25 inches to 4.25 inches x 6 inches. The only stamps on them must be USPS stamps or metered. All stamps are removed before the postcards are given to the inmates. The only ink that can be used on the postcards is blue or black ink. Email: Inmates cannot receive emails, but you can email the Maricopa County Sheriff’s Office through the link at their official website. Security Level: Pretrial confinement; all security levels with offenders who have not been classified. Post-conviction confinement is for inmates who have been convicted misdemeanor or low-level felony offenses and have received a sentence of up to one year in jail. Distinguishing Feature: Maricopa County Jail is known throughout the nation as the home of the Tent City Jail. The Tent City Jail was begun in 1993 and was Sheriff Arpaio’s effort to balance the problem of overcrowding with his desire not to release inmates before the end of their sentences. Number of Inmates: The jail has a varying daily population, but the total capacity of each jail is as follows:4th Avenue- 2,064, Durango 2,214, Estrella- 1,000, First Avenue- 500 but the jail is currently being used as an animal shelter and not currently housing inmates, Lower Buckeye -2,440, Madison- currently closed, Tent City- 2,126, and Towers- 1,080. Employees: The Maricopa County Sheriff’s Office has over 3,400 employees, but those employees include other law enforcement officers and civilian employees in addition to corrections officers. 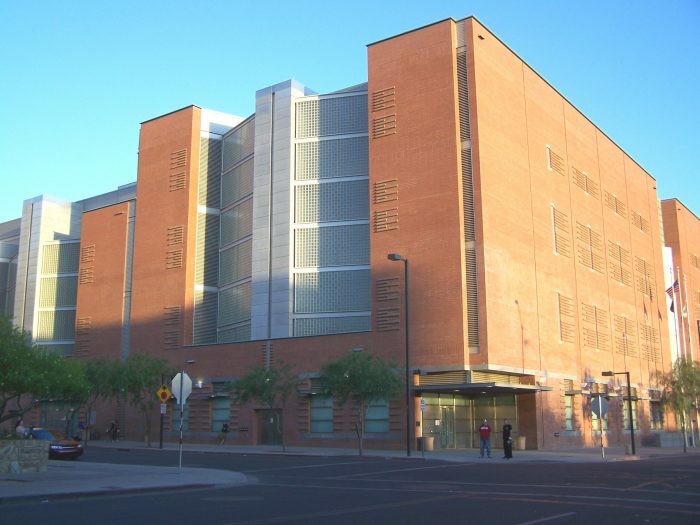 Overview: The Maricopa County Jail is, by design, one of the most difficult correctional facilities in the United States. Inmates live under very rigorous conditions, by intention. However, while the living conditions are difficult and harsh, the jail seems to be free of some of the problems that plague many other jails. Inmate Population: The population at the Maricopa County Jail includes all adult pretrial detainees in the MCSO system, which means that it has offenders of all levels. These offenders may not have been classified because of their pre-trial status. However, the jail has facilities for high-level, high-dangerous offenders, separating them from the other inmates. In addition, the Maricopa County Jail also has a veterans-only housing unit. Living Conditions: Living conditions in Maricopa County Jail are notoriously difficult. While they vary from jail to jail, some of these harsh conditions include: the tent city jail, where inmates literally live in tents; the use of male, female, and juvenile inmates in chain gangs; feeding inmates only twice a day with meals costing between $.15 and $.40 and with no salt or pepper available; and the pink underwear that inmates wear. Prison Programs: Maricopa County Jail emphasizes education. In fact, Hard Knocks High is the only accredited high school program in an American jail. Substance abuse and addiction treatment is also critical and inmates have access to substance abuse programs. Production: Maricopa County Jail is not associated with any production, but inmates are not only responsible for providing services for the jail facilities, but also work on chain gangs. These chain gangs provide labor for the community. History: The history of the Maricopa County Jail has become interlocked with the history of the very controversial Sheriff Joe Arpaio. His harsh policies have changed the face of the Maricopa County Jail to such a significant extent that one must consider his era separately from the rest of the facility. Famous Inmates: A number of former Maricopa County Jail inmates became famous because of problems that they encountered while at the jail, including: Scott Norberg, Richard Post, and Brian Crenshaw. Find an Inmate: The Maricopa County Sheriff’s Office inmate locator tool allows you to search for an inmate by first or last name, booking number, or date of birth. Send Money to an Inmate: You may deposit money into an inmate trust account in a number of ways, including machines located in the lobbies of some of the jail facilities, online, by phone, and through third-party providers. Visit an Inmate: The Maricopa County Jail has both remote video visits and on-site video visits. Remote visits are 20 minutes in length and can be scheduled between 7AM and 9:30PM daily. On-site video visits are 20 minutes in length and can be scheduled between 9AM and 4:30PM daily, excluding holidays. Receive calls from an Inmate: Inmates can place collect phone calls and can set up advanced pay accounts with provider GTL in order to place phone calls to numbers that cannot receive collect phone calls. Calls may be recorded or monitored and phone calls cannot be transferred or forwarded. Email an Inmate: Inmates cannot receive emails.